To start off this series of what I wore posts, I think a review of some of the outfits I’ve posted on Instagram last year is as good a way as any. I’ll share some of the thought that went into the combinations, as well as what I liked or didn’t like about each one. Instagram is a great way to share the completed outfit, and I enjoy seeing the combinations that other people come up with… but sometimes I see a particular tie and pocket square, or tie and jacket pairing that wouldn’t have occurred to me and I wonder how it was arrived at. I don’t always feel that Instagram is the best venue to ask questions like that, or for me to write in detail about how I made my decisions. If you wonder the same thing about some of my combinations, then I hope you enjoy these posts. Feel free to ask a question in the comments. This outfit was purely shades of grey. 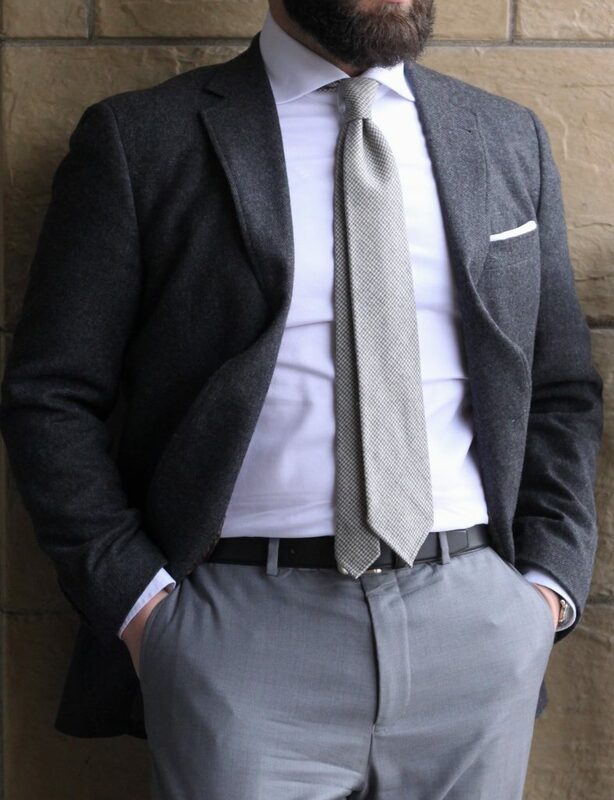 The jacket is a charcoal tweed twill from Abraham Moon & Sons made up by Brooks Brothers, trousers are light grey flannel, shirt and pocket square are white, and the tie is a warm light/mid grey houndstooth in wool. Overall, the look is ok to me. The monochromatic look can be difficult to pull off, and if you’re going to do a one-colour combo, I’m not sure grey would be the one to do it with. I do like the look, but in the last year have not worn this combination again. I think it could work with a dark grey jacket that had some pattern to it – perhaps a windowpane, or a Prince of Wales. I think a little bit more visual interest from a patterned would change this from being big blocks of plain grey and white to a more enjoyable (less boring?) combination. Would you wear an all grey outfit? Why? Why not? Let me know! This outfit was one I wasn’t sure about until I saw the pics. I’d picked up this light brown wool/linen blend herringbone jacket on sale from Spier & Mackay, but actually hadn’t worn it much since I felt it was too light to pair well with grey trousers. In the summer I decided I was going to figure out how to wear this jacket more often, or have to get rid of it. I paired it with a light blue shirt, chive green matka tie from Vanda, and the Rickshaw Cart pocket square from Kent Wang. I really quite enjoyed this combination, and I learned that it was going to be a keeper so long as I could push just a little bit outside my comfort zone with each wear. This was actually the first outfit I posted on Instagram to receive a repost from a big account. Overall, I think this is a great Spring or Summer combination that I would happily wear again. 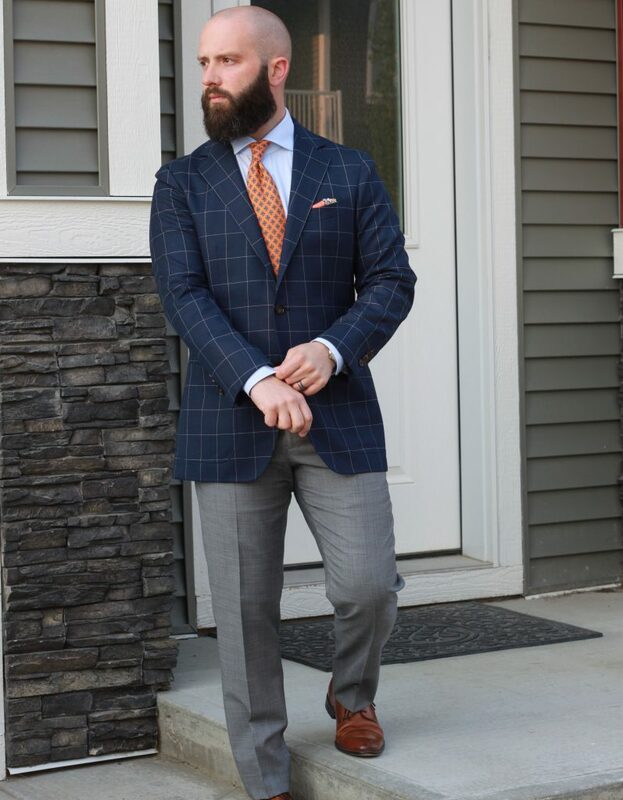 This bold windowpane jacket is actually part of a suit that I bought; fortunately with unpadded shoulders and patch pockets it can easily be worn as a separate piece. This was the first configuration I wore it in, as I had to ease in to this loud of a suit pattern – at this point everything I owned was pretty much a solid or textured fabric. I bought the tie from LuxeSwap on eBay, after seeing a post on StyleForum or Instagram that I wanted to emulate (more on that learning process in another post). I think it is paired really well with the jacket as they are both strong elements that balance eachother, and are in turn balanced by the plain light blue shirt and light grey trousers. The mid-brown/tan shoes carry the lightness down to my feet. The pocket square is the same Rickshaw Cart from Kent Wang, folded differently than in the above post (puffed as opposed to corners up). I think this was a great Summer look, and I continue to wear this suit as separates. Winter. Tweed. Flannels. I love the rich textures that Fall and Winter clothing has. Take this Kilcarra Donegal tweed fabric from Abraham Moon & Sons made up by Spier & Mackay in their awesome Neapolitan cut – wider lapels with negative belly, 3 roll 2 buttoning, sweeping open quarters and a natural shoulder. Committing to the idea of texture, I chose a navy grenadine tie and a wool-silk pocket square (the Great Wave – a favourite!) both from Kent Wang, along with trousers made up in a lovely light brown – winter white – flannel from Vitale Barberis Canonico. Not pictured here are my dark brown suede wingtips. 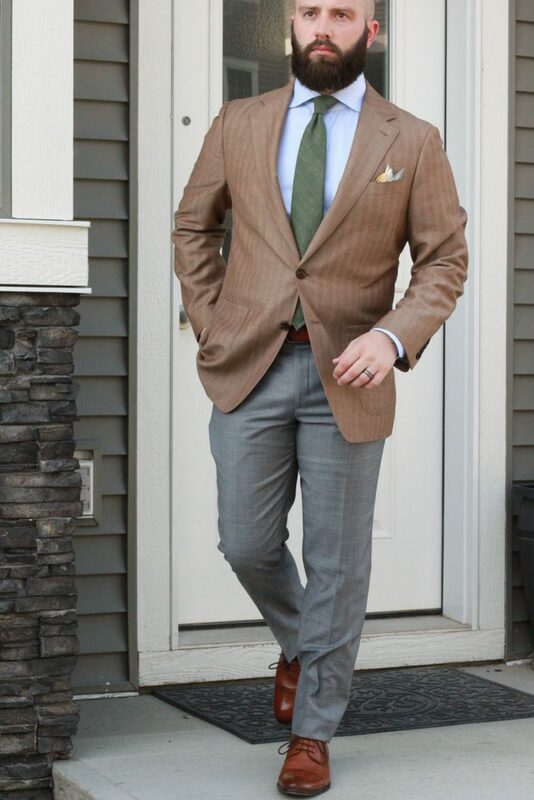 I definitely enjoyed wearing this combination – the greyish brown of the jacket serves as a nice counter point to the navy tie, and the textures are balanced overall. 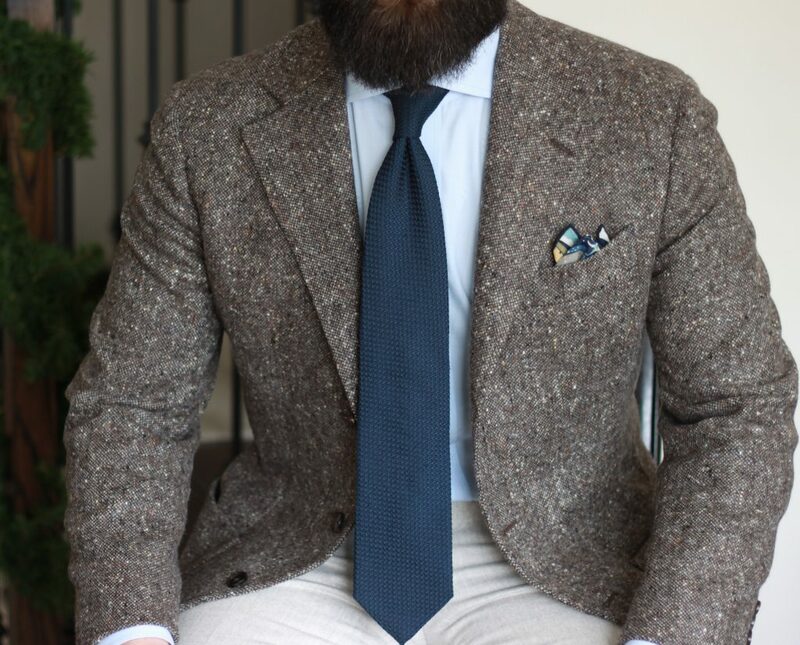 Wool/silk blends are awesome for pocket squares, especially when pairing them with other wintry textures. The flannel trousers are thematically aligned with the jacket – warm neutral colour that picks up some of the famous flecks in the Donegal fabric, subtly textured (flannel and tweed are perfect together), and functional in the colder months.